“The journey of a thousand miles begins with a single step”; a saying by which Hiba Qandeel lives by and believes is the inspiration behind her success today. A little over 10 years ago, Hiba thought about starting a business from home to support herself financially. After taking a training program by a local initiative on food-processing, she started making what she knew how to do best; apple vinegar. Her business grew in no time and before she knew it, the entrepreneurial bug had bitten her. She wanted her business to expand and she knew that in order for that to happen, she had to formalize it. Home-based businesses were not legal in Zarqa at the time, but that did not stop her. She did everything in her capacity to activate home-based business licensing in Zarqa so that she can take that next big step. 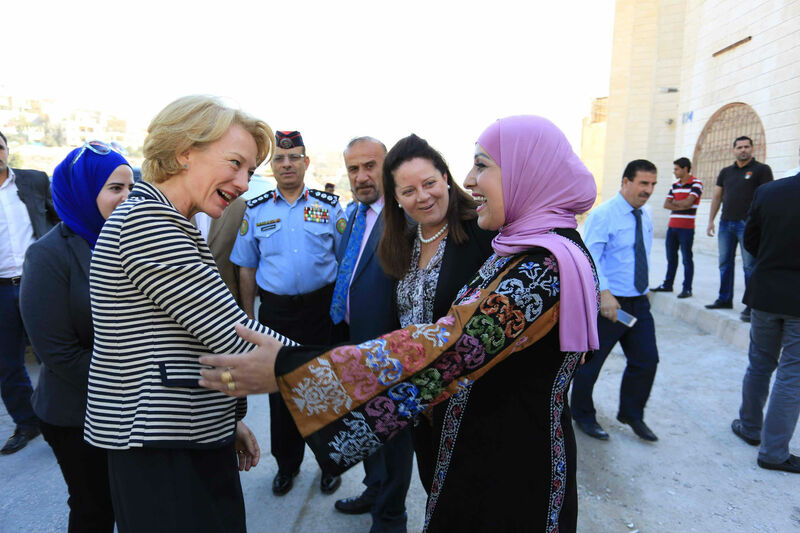 Three months later, she became the first person to successfully lobby the Greater Zarqa Municipality and obtain a vocational license for her home-based business. A few months later, she rented a small space and started a production line for vinegar under the name of “Hiba Nature for Natural Products”. Apart from her specialty, apple vinegar, she made other types of vinegar that were hard to find elsewhere such as raspberry, citrus, and garlic, as well as natural rosewater and orange blossom water. Everything was done manually, from making the vinegar, to labelling and packaging. “Having my own factory felt incredible, I never took it for granted, not for a second. However, the production process was very tiresome; making the smallest order would take a lot of time” said Hiba. And that’s when she considered getting financial support to automate her work and sought help from the USAID Jordan Local Enterprise Support Project. The grant enabled her to rent a bigger space and buy new machines and equipment. “We do everything with machines now, and we finally have the capacity to take huge orders unlike before” said Hiba. Apart from her husband who is the sales manager in the factory, Hiba only employs women. “We women need to know that we can’t just sit at home waiting for a miracle to happen and change our lives. I believe we’re all capable of achieving remarkable things. We just need to work hard. There is always time to start a new dream”. Hiba employs 8 women on a full-time basis, and up to 15 women on a seasonal basis. Hiba’s factory also trains local women in collaboration with a local initiative on food-processing, testing and packaging. The products of these women are displayed in the factory and Hiba markets them as if they were her own. Her factory has trained over 500 women in the past few years; many of which have started their own business after receiving the training and are now successful MSE owners. “I tell other women to try to explore their potential with courage and confidence as nobody will give you anything on a platter; you have to work hard to taste success”. The word “tough” was all Hiba could think about when asked about what stands out the most to her when she looks back at her 10-year journey. “It wasn’t easy getting to where I am today. If I wasn’t persistent or stubborn at times, none of this would have been possible. I let my daughters work at the factory during holidays and sometimes after university just to experience a little bit of what I had to go through so they’d have the life that they have right now”. Hiba’s thousand steps’ journey will not stop here. She says she dreams of having a farm to grow her own vegetables and use them for making her products. She says this will enable her to become somewhat independent and sustainable, and will provide more job opportunities to the women of the area. “I started with just one apple, and now I own an apple vinegar making factory. One apple; that’s what it took for me to take the first step” said Hiba with a big smile on her face.